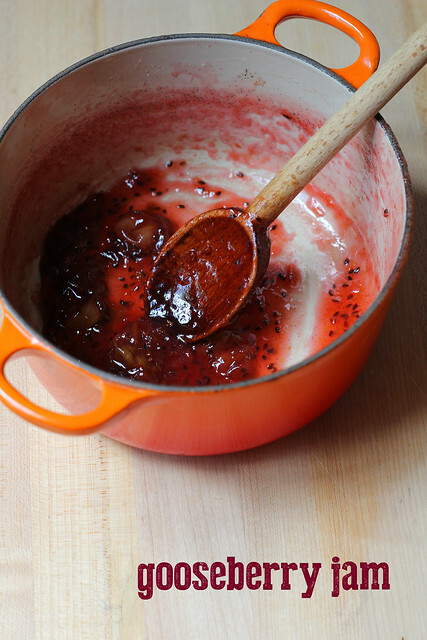 In honour of the Royal Baby, I’ve whipped up something that I think of as very British– gooseberry jam. Gooseberries are high in pectin, so they’re ideal for jamming. Also, when my CSA gave them to me last weekend, I really couldn’t think of anything else to do with them. I had just two half-pints of gooseberries, so I weighed what I had and scaled down the recipe below accordingly. Even though I had a mix of red and green berries, the jam took on a brilliant rosy color as it bubbled away. My little batch cooked quickly, and gave me a pint of jam plus a smidge extra (that’s what’s left in the pot). A raw gooseberry packs a tart punch, but this jam has a great sweet-tart balance and just a hint of vanilla. Maybe I’ll fold it into whipped cream for a fool or a trifle. That is, if we don’t eat it all on our morning crumpets. Did you know that “gooseberry” is British slang for what we call “third wheel”? Interesting. Steph’s Notes: This is a pretty small batch of jam– small enough that I personally would just store the jars in the fridge and not bother to water bath process them. You can certainly process them to extend shelf life, though, if you choose. New boxes of Ball jars come with instructions on how to do this, or you can find great tutorials online (like this one). If you have trouble telling if your jam is done, you can pop a small plate into the freezer to chill. Spoon a teaspoon of the fruit mixture onto the cold plate and allow to set for 30 seconds. Tip the plate 45 degrees to one side; jam should be a soft gel that moves slightly. If mixture is liquid and runs quickly down the plate, return the jam to the heat and cook, stirring constantly, 2-5 minutes longer; then repeat the test. -In a heavy-bottomed pot, combine the gooseberries, sugar and lemon juice. Cover with the lid and bring to a simmer over medium-high heat. Remove the lid once the mixture is simmering and stir in the vanilla bean seeds. Continue to cook over moderate heat, stirring frequently with a wooden spoon, for about 15 minutes. Skim off any scum that rises to the surface of the jam during the cooking process. -You’ll notice some changes in the fruit mixture as it reaches gelling stage. These changes are subtle, but as the jam starts to set, you’ll feel your spoon “drag” on the bottom of the pot when you stir, and the boiling bubbles will slow (similar to candy making). Also, when you hold your spoon up, the liquid will run off the side of it in thick, heavy drops. If you are uncertain, use the cold plate test described in the above notes. -Spoon or funnel the jam into four clean 1/2-pint jars (even though I don’t water-bath process small batches of jam, I still like to carefully pour boiling water over the jars, lids, funnel and metal spoon before using them, or have them fresh from the dishwasher), leaving about 1/4 inch of space at the top. Close the jars and let the jam cool to room temperature. Store the jam in the refrigerator for several months. This is an excellent recipe and very easy to make. Perfect for my breakfast with toast. Looks like it was real good! Love your photo! ive never had gooseberries before but this jam looks really good, chunky and wobbly, just how jam should be! I’ve never cooked with gooseberries before and now I think that needs to change! yum! i have also never cooked with gooseberries! honestly, i’m not sure where i would even find them around here but if i do see them i will have to scoop them up!!! Being British, I know that ‘being a gooseberry’ is the worst! (I wonder why? because you are the sour note in an otherwise sweet evening?!) Jam looks lovely though!